You may have recently had a personal water well installed. Congratulations to you for making a smart decision for your residential or commercial property. You’ve already seen how much money you’re saving by no longer having to pay a monthly water bill. Additionally, your household gets to enjoy the benefits of having clean, filtered water that always has good pressure. If only things can always stay this simple and easy. The only way to make sure your personal water well stays in good condition is by doing regular maintenance checks. Ask an Algonac well drilling company these three important questions regarding well maintenance and care. 1. When Should Maintenance Checks Be Scheduled? Knowing when you should schedule your water well maintenance check is more important than you think. Water is a beautiful thing, but we take it for granted. We don’t realize how important water is in our lives until something horrible happens to it or we lose it completely. Take the time to discuss when a maintenance check should be done with your Algonac well drilling company. Usually, maintenance checks are annual, so scheduling one won’t be a hassle. When you factor in the price and inconvenience of dealing with bad water or a damaged well, maintenance checks seem incredibly important and worth the cost. 2. What Are All the Bad Signs I Should Look for? As a homeowner or someone who works on commercial property, you need to make sure you look for the obvious signs of something faulty happening with your water well. It’s no harm asking your well-drilling company about some common signs that show that there is something going on. There are a few other signs to look out for and some of them connected to the time of the year. Just keep the above list in mind when you feel that something’s off about your water. To reduce the chances of having issues altogether, well maintenance is key. That way, you can keep your water safe and flowing throughout your home, and ready to use whenever you need it. 3. Is There Anything I Can Do to Stop the Current Problem? If you’re dealing with a problem that’s directly affecting your home, you’ll be able to do two things: get immediate help or wait and let the issue get worse. If there are technical issues with the water well equipment, it may be beyond what you can handle on your own. And that could mean telling your family not to use the water in the house until everything gets sorted out. However, having a close relationship with your well drilling company can make all the difference and help you reduce the inconvenience to your family. 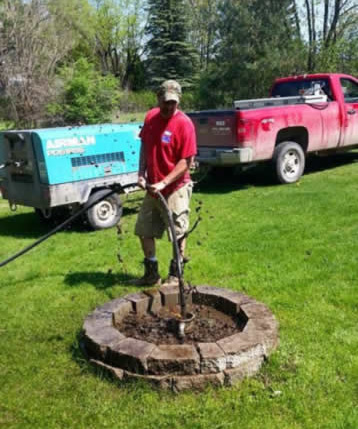 Just ask your professional well-drilling company to come and look at your well for a maintenance check. They’ll know what to do and how to take care of any possible issue before it becomes a serious problem. Are you looking for an Algonac well drilling company ? Ries Well Drilling, Inc. is an exceptional well-drilling company that serves the people of Macomb , St Clair, Lapeer and Oakland Counties. Contact them today for all of your water well needs.